Our meal prep supplies help save time, money, and hassle as you cook up your meals for the week. We carry mixing bowls, food processors, measuring spoons, and cutting boards so you can easily combine your ingredients to make a delicious entree. Our deli containers, freezer bags, microwavable containers, and vacuum sealers provide convenient storage for your food to stay fresh during the week. When you’re ready to reheat, we offer countertop warmers and roaster ovens to get your meal to the perfect temperature. You may also be interested in portion scales, aluminum foil pans, and cooler bags to help you meal prep. 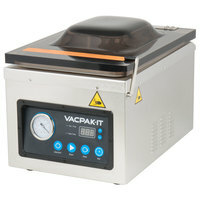 If you're wondering where to buy vacpak-it meal prep supplies, we have a large selection of vacpak-it meal prep supplies for sale at the lowest prices.